Given his huge involvement in this film (including producing, choreographing and writing the script), an intriguing maturity has crept into the work of Jackie Chan as he enters his later years. China make a lot of dramas set during the Warring States period, but very few comedies. Although Chan is effortlessly likable, the film is still no less aggrandising than, say, A Battle of Wits, or Hero, or The Emperor and the Assassin, or any other film dealing with the tumultuous story of a pre-unified China. All tell of a bloodthirsty struggle, the influence of the every-man, and the compassionate but powerful principals required of leadership. These are quite weighty subjects for a Jackie Chan film, who normally avoids mixing political messages with all the somersaulting. Here he plays a lowly, opportunistic foot soldier with no great martial arts abilities who survives a huge massacre by feigning death. 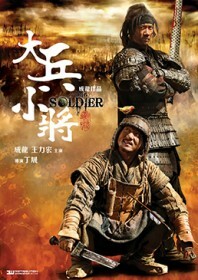 A rival Wei clan general is the battle’s only other survivor, and Chan takes him hostage. The two proceed across dangerous, divided terrain in an attempt for Chan to claim a reward for his rival’s capture. Violent clans trail in hot pursuit, including a group of nomadic marauders and Chan’s very own bloodthirsty overlords. Although there is much to commend Chan for exploring deeper subject matter – particularly in comparison to his western films – there are still quite a few problems here. There is a restless energy which can never quite settle into a buddy comedy, a chase film or a straight historical epic, and a butchered editing job makes the roles of supporting actors – like that of singer Lin Peng – seem completely redundant. However, the film could pave the way for more thought-provoking work from Chan in the future. Studio: Bona Entertainment, JCE Movies Ltd.